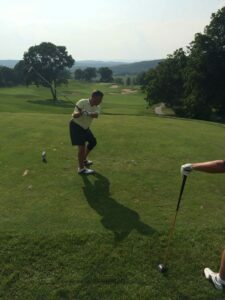 The Eastern Aerosol Association’s (EAA) annual Golf Outing will take place Tuesday, August 4 at picturesque Crystal Springs Resort in Hamburg, NJ. In response to several suggestions from EAA members, the Board decided to modify the regular format, expanding it to a two-day event and incorporating a day of hands-on technical workshops. The three 90-minute workshops, being held Monday, August 3 at Crystal Springs Resort, will be designed to offer educational training and instruction from technical experts in various aspects of aerosol packaging. Joe Franckowiak, Berry Plastics, teeing off on the 18th hole. The first workshop will concern can formation, measurement, testing and performance, including different types of containers, sizes, shoulder styles and more. The second workshop will be all about filling, crimping and product testing, including how filling works and how propellants interact with products. Finally, the third workshop will center around gaskets and valves. A mini “Valve 101,” it will include discussion of gasket swell testing and different types of valves and gaskets and how they affect delivery. The following day, Tuesday 8/4, the Golf Outing will go on as usual. Last year’s event included golf on the links style Wild Turkey course, closest-to-the-pin and putting contests, lunch, dinner, prizes and cocktails. The first place team, with a -11, was comprised of Brock Manner and Charlie Ortmann, Diversified CPC; and Bart Bastian and Nikko Lavey, Spray Products. There will be no EAA Fall Meeting in 2015. For more information, registration or special room rates, check www.easternaerosol.com.